It was a rainy day in San Francisco. After lunch with her family, Cindy found the road to her Civic was blocked from traffic and workers in uniform next to her car. 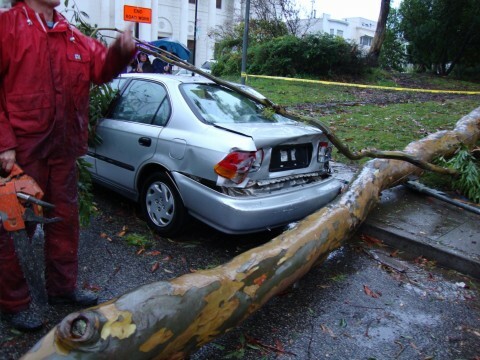 A big tree branch had fallen on her car and smashed the trunk! In case you wonder, the front still looked perfect! A clean-up crew member handed Cindy a claim form to report the damage to the city. This marked the return of Cindy and Kenny’s car-free life in San Francisco.